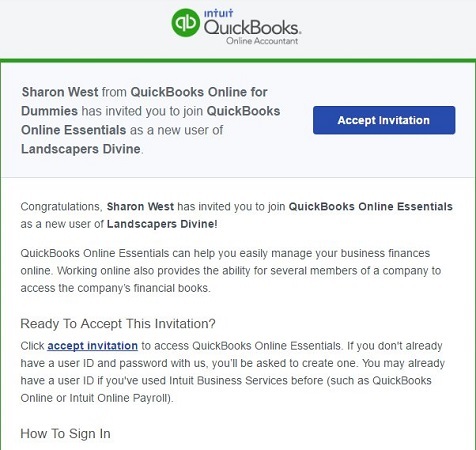 When you create a company for a client in QuickBooks Online, you can assign yourself as the Master Administrator; in this case, QBOA also assigns you as the Accountant user for the company. But you can transfer the Master Administrator role back to your client; this process won’t affect your status as the Accountant user. The process of transferring the Master Administrator role to a client involves first inviting the client to become a Company Administrator. After the client accepts the invitation to become a Company Administrator, you can transfer the Master Administrator role to the client — again, using an invitation process. Open the client company using the Go to Client’s QuickBooks list on the QBOA toolbar. 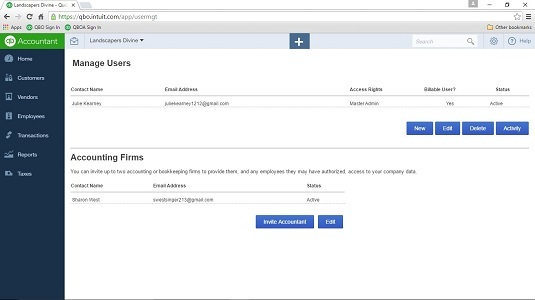 The first time you open a client QBO company, the Welcome to QuickBooks wizard walks you through some basic setup steps, where you fill in the client’s contact information, industry, and legal organization as well as some additional basic information, and QBO creates a Chart of Accounts for you. Click the Gear button on the QBOA toolbar and choose Manage Users. 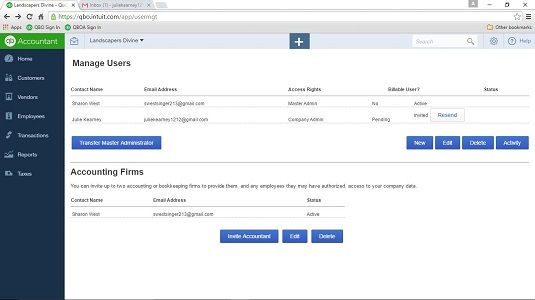 QBO displays the Manage Users page, which also contains the list of accountant users in the Accounting Firms section. 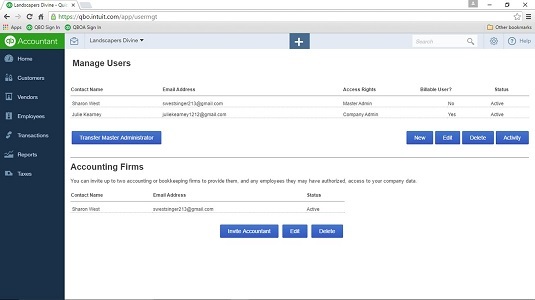 Note that the accountant user in the Accounting Firms section at the bottom of the page and the Master Administrator in the Manage Users section at the top of the page belong to the same QBOA user. Click New in the Manage Users section to add a new Company Administrator user. On the Choose User Type page, select Company Administrator and click Next. On the Enter User’s Email Address page, provide the client’s email address (and optionally, name) and click Next. 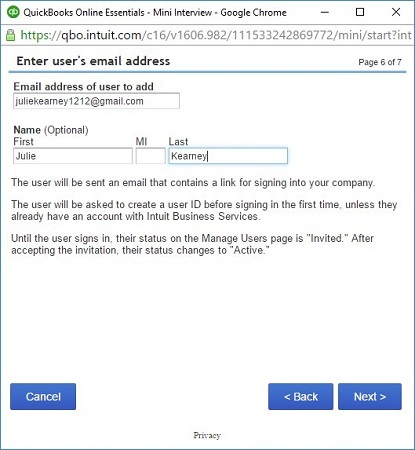 The Finish Adding User page appears and explains that QBO will send an email invitation to the user to sign in to the company. 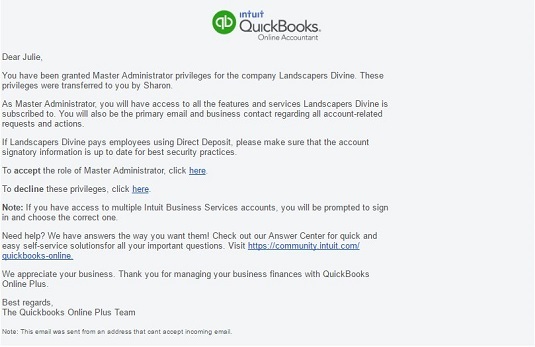 The email explains that he must create a QBO user ID unless he already has one. In most cases, if you set up a company for a client, the client doesn’t yet have a QBO login. The new user appears on the Manage Users page in Pending status. When the client receives the email invitation to become the Company Administrator, the invitation looks something like this. 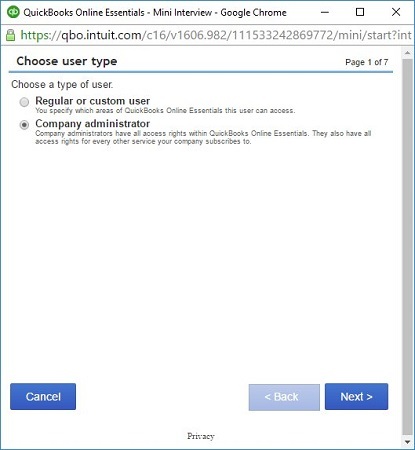 When the client clicks the Accept Invitation button in the email to accept the invitation, a QBO login screen appears using the qbo.intuit.com web address. Typically, the client doesn’t have a QBO login yet and so goes through the process of creating a new one; when he finishes, he’s logged in to QBO and receives a message indicating that he successfully accepted the invitation. In the meantime, you, the QBOA user, can use QBOA to open the client’s QBO company. On the Manage Users page, you can see that the status of the client’s Company Administrator role is no longer Pending, but you are still listed as the Master Administrator. In QBOA, open the client’s company. The Manage Users page still lists you as the Master Administrator. The Transfer Master Administrator Role page appears. Select a user who should assume the Master Administrator role. 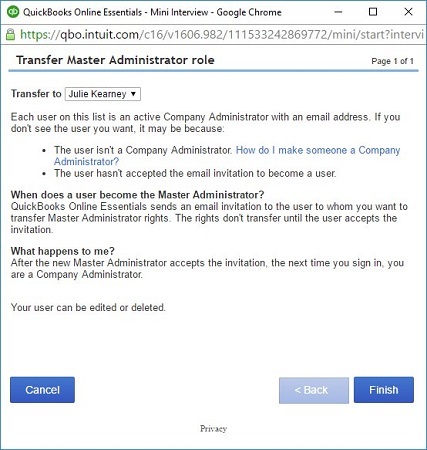 QBOA sends an email invitation to your client to become the Master Administrator; the email looks very much like the one below, and the client can accept or decline. Assuming the client accepts, he’s prompted to log in to QBO. Once he does, he sees a page that explains that the Master Admin role has been successfully transferred to him and that an email explaining such has been sent to the former Master Administrator — and that’s you. If you once again use QBOA to open the client’s company and view the Manage Users page, you’ll notice that you no longer appear in the Manage Users section and your client is the Master Administrator for the company.